In 2005 the anthropologist Sam Osmanagich, Ph.D., made an incredible archeological discovery in Visoko, Bosnia-Herzegovina, a complex of five enormous pyramids covered by soil and green vegetation, which he named “The Bosnian Valley of the Pyramids”, previously considered just to be green hills. The largest of them, the Bosnian Pyramid of the Sun is over 720 feet high (220 meters. ), considerably higher than the Great Pyramid of Egypt of 482 feet (147 mt.) high. There are four other smaller ones, the Bosnian Pyramid of the Moon (623 ft. / 190 mt. ), Pyramid of Love, Pyramid of Dragon (295 ft. / 90 mt.) and Temple of Mother Earth. In the nearby Vratnica village, he discovered also the tallest Tumulus in the world, 200 feet (61 mt.) high. Famous Sillbury Hill in England is 196 ft. (60 mt.) high. It is an artificial conical hill and consists of two-layer megalithic terraces, clay layers and artificial concrete layers. 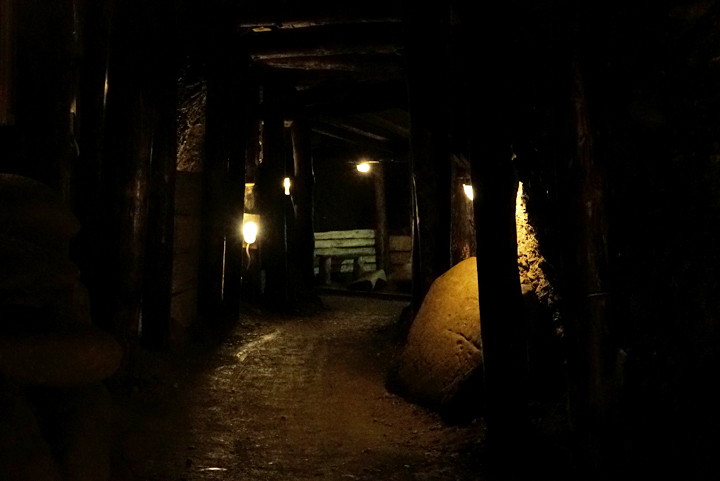 In addition, he found also the entrance to the Underground Labyrinth, called Tunnel Ravne. Locals used to consider it small natural cave. Excavation confirmed that entrance leads to an even more extended system of an underground network under the Pyramid of the Sun, which is 1.55 ml. (2.5 km.) distant. Also the Tunnel Ravne is the biggest and most complex Tunnel system ever discovered. Upon making these remarkable findings, which would shock an unbiased scientific world, Dr. Osmanagich was immediately attacked by the mainstream media, accused of orchestrating a hoax designed to bring money to his native Bosnia. He was ridiculed as a Bosnian Indiana Jones, an amateur archaeologist doing pseudo-archaeology. Despite Dr. Osmanagich’s proofs that these are man – made structures in perfect orientation with the cardinal points of the compass, several so called experts, dismissed these proofs and claimed that they were just natural hills, and that there were no pyramids in Bosnia. Interested in archeology and in this project for many years, finally I visited the site in Visoko, the first time, in August 2016. I was there for 40 days, having a lot of fun helping as a volunteer to remove 1 meter (3 feet) of soil and clay from the concrete surface of the base of North side of the Pyramid of the Sun and in the Tunnel Ravne labyrinth, helping to bring out the excavated fill-in material. But, as a photographer, I also wanted to document the older and most active archeological site, with the biggest and mysterious pyramid ever discovered and hopefully bring to the attention of the world. Before I went there, I wrote to Dr. Sam Osmanagich, about the project I wanted to do there, beside the volunteering work, so I had the pleasure of spending weeks with him and photographing him around the site, on group tours and to scientific conferences. Then I went back to photograph again in May and in September 2017. It is incredible to me that scientific findings of such magnitude have been dismissed by a biased group of individuals with a clear interest in suppressing them. 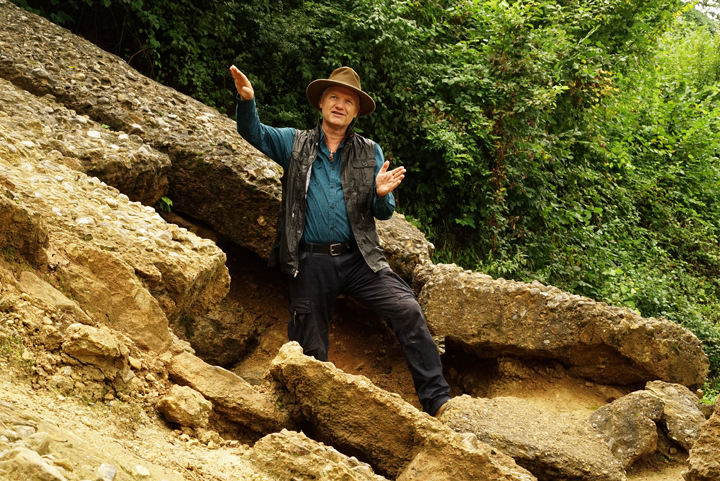 I was very fascinated by the interesting and long “Odyssey” that this Bosnian Project went through in all the years and by the stunning discoveries made by the Bosnian Indiana Jones. From the beginning, Bosnian archeologists, geologists from the University and curators from the National Museum of Sarajevo, attacked him when, after removing 1 meter of soil, he found evident construction material. He found perfect man – made concrete blocks (15 X 5 Feet X 1, 5 foot, 7 Tons heavy), perfectly aligned, disposed in 4 rows, shifted for a better stability of the entire walls’ structure. It is not necessary to have a Ph.D. to understand obvious things or to distinguish if something is made by intelligent hands or by nature. This concrete has also been analyzed and shown to be man – made and with a high quality, harder (up to 133 Mpa) than modern concretes (10 to 60 Mpa) and with a very low water absorption of 1%, that normally is 1% to 3%. These proofs clearly indicate signs of human construction and civilization. 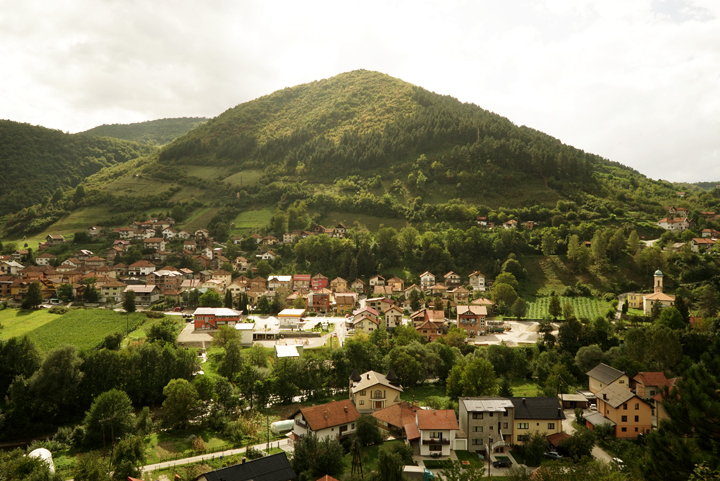 In 2006, when Dr. Sam Osmanagich announced that he would start digging to look for more structures, 23 leading Bosnian academic archeologists, geologists, historians, and museum curators signed and sent a petition to the Bosnian government asking them to do not allow the excavations. The Bosnian Prime Minister went to visit the site and when he saw the four layers of big man – made concrete blocks and thousands of tourists, he allowed Dr. Osmanagich to continue to excavate, because this archeological discover would also be good for the economy. Although he revealed more concrete blocks in the Pyramid of the Sun’s construction, these “experts” asked the help of the President of the European Archeology Association of the U.K., to stop the Bosnian Pyramids Project. They started to write to magazines and newspapers and claimed, on their web site, that Dr. Osmanagich is an amateur archaeologist, not an expert, and that this project was a big archeology “hoax”. Then, the President of the European Archeology Association of the U.K. and other archeologists from Germany, France and United States signed another petition to stop the project. However, the Bosnian government rejected it. Not only did Dr. Osmanagich not have help, he suddenly had a lot of aggressive enemies in Europe. He decided to invite an expert in Pyramids from Egypt, Dr. Ali Barakat, who spent 42 days on the site in Visoko. At a scientific conference in Sarajevo, on the 23rd of June, 2006, Dr. Barakat declared that the Bosnian Pyramid of the Sun is a man-made pyramid. He sent a report of his findings to his superior in Cairo, who immediately organized a meeting with the Ministers of Culture and Tourism, and the Supreme Council of Antiquities. The subject of this meeting was the detrimental impact the Bosnian Pyramids would have on the highly profitable international tourism to their own pyramids in Egypt. Afraid of this prospect, these bodies summarily declared that there were no pyramids in Bosnia and that the concrete blocks were a natural phenomena. Dr. Barakat was labeled as a non-expert in pyramid archaeology by his superior Dr. Zahi Hawass, and upon his return to Cairo he was fired from his job from the Government. The discovery of the Bosnian Pyramids is not just a local archeological issue, but an international, scientific, economic and political issue. Although Dr. Osmanagich’s support from Egypt was withdrawn, fortunately his project gained a lot of attention all around the world. He received help from thousands of volunteers from 62 countries and 6 continents (total of 2.400). Scientists from many countries visited the Bosnian Valley of the Pyramids to perform research on various aspects of the pyramid complex. The Bosnian Pyramids Project quickly became the most active and open archaeological project on the planet. Not elite science, not selection of information, no hidden knowledge. Unfortunately even these many volunteers are not enough for a big project like this. There is a great deal of excavation work to do on these huge pyramids and an endless amount of scientific research. Then, more problems came when the president of the State Commission for National Monuments in Bosnia suddenly changed the law declaring that the majority of the area of the Pyramids was “protected.” Protected from what? Protected from their true archeological and scientific investigation. 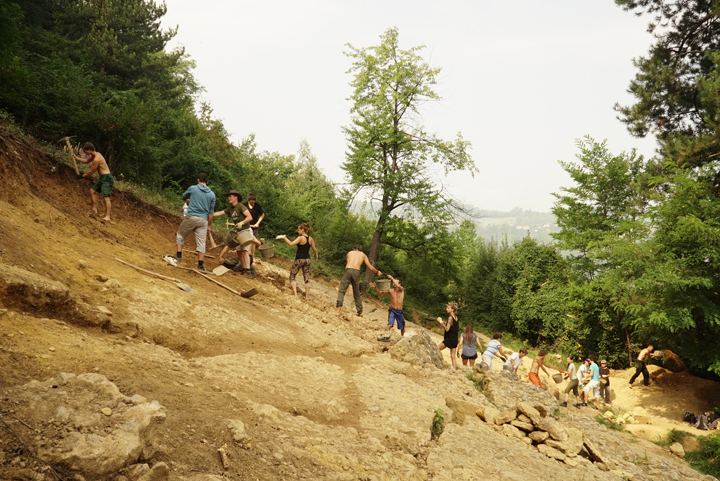 Even in a protected area, it is possible to ask permission, so Dr. Osmanagich, in 2005, created a nonprofit Foundation called “Archaeological Park: Bosnian Pyramid of the Sun” for archeological digging. He wrote about the project, connecting with the University of Cairo and the biggest archaeological faculty in the world, but his project was rejected 3 times by the Federal Institute without explanation. Also the Minister of Culture declared on TV that he would never grant permission or money to continuing this digging. Dr. Osmanagich continued to dig in the unprotected areas around the pyramids and in the Tunnel Ravne, where his Foundation has received permissions to explore the underground labyrinth from the Regional Ministry of Forestry who’s the owner of the land and the Regional Ministry for Culture for archaeological work in 2006. But again, he was attacked by many journalists, writers, magazines, and by the most influential and powerful archeologists, Egyptologists and geologists. Also the European archeological associations, American anthropologists, academies of sciences, Federal government and the Bosnian political parties were against him. All were hoping that he would give up and we would never hear anything again about the Bosnian Pyramids. But Dr. Sam Osmanagich is a determined person, and he continues the fight for his important archeological discovery, for love of the research and the truth, which is the cultural patrimony for everyone. Dr. Osmanagich took the government to court and sued them. After five years, in 2012, the judgment was given in his favor and against the government. Finally, he and his international teams, volunteers and employees could come back and continue the excavations in some legally permissible areas. Unfortunately most of the surface of the Pyramid of the Sun is covered by tall pine trees which became “protected,” and there are also a lot of private proprieties. So, it will still not be very easy to dig freely where necessary, but only in certain areas. Not only more concrete blocks have been cleaned up in time, but also many pavement stones on different levels composing structurally inclined terraces on the Pyramid of the Moon. Also various archaeological features of the Pyramid of Love, the Pyramid of the Dragon, and the Temple of Mother Earth, as well as of nearby Vratnica Tumulus. In addition, a lot of interesting studies and scientific observations of different energy phenomena have been continued independently by Dr. Osmanagicih and the collaboration of an independent, international, scientific researchers’ team. Already at the beginning, when it was first studied, in 2006 and then in the following years, the characteristics of this geological location, scientists discovered a large iron plate beneath the Pyramid of the Sun. As we know, iron produces a magnetic field, and the tunnels’ running water creates electric currents and also release (health-giving) negative ions and natural magnetism. These natural elements together produce powerful natural energies, and apparently the pyramidal shape above amplifies these energetic phenomena. Also a LIDAR scan of the site has demonstrated that these structures have pyramidal faces oriented toward the cardinal points. Indeed, the Bosnian Pyramid of the Sun has the most perfect orientation to Cosmic North of any pyramid thus far analyzed on the planet. The scan also shows the presence of inclined spiraling claystone terraces and its extended underground system Tunnel Ravne. It’s a network of 7 different levels of passageways, from 32 Ft. (10 Mt.) to 1,148 Ft. (350 Mt.) depth, producing a spiral formation with many inner chamber networks and also different channels of (pure) water and it runs for over 10 miles (16 km). Energy screening shows that the ionization level of the air is 43 times higher than the average concentration outside, which makes the underground chambers into “healing rooms”. Having in mind the fact that there is not technical radiation (from our technology) or cosmic radioactivity, this underground labyrinth is an ideal place for the body’s rejuvenation and regeneration. This prehistoric tunnel system was filled in approximately 4,600 years ago, but some connecting and ventilation passageways, and some large dead-end chambers and water channels were not filled in. The reason why this big tunnel system, at one point, was closed is unknown. Currently the tunnel system is being excavated of loose sand and riverstone. During this excavation, many small artifacts have been found, (I also found 2 interesting artifacts), as well as big stones, quartz crystals and huge ceramic megaliths, up to 18,000 pounds (8 Tons), with unknown symbols and Runic alphabet incisions. Unfortunately, there are not a lot of information about the ancient European civilization which lived here and built these huge structures. Another big question was to find scientific elements to date the age of this apparently very ancient site. Dating studies of the soil which covers the pyramids today, based on depth, humus and clay content show ages from 12.000 to 15.000 years old, indicating that the pyramids are even older. In 2012, organic material was found between the concrete blocks and shown by radio carbon dating to be 24.800 years (+/- 200 years.) giving already the minimum age. Finally, in 2013, between the first and the second concrete block, a fossilized leaf was found and the result from the radio carbon dating calibrated to the calendar date was of 34.000 years old! This was a really great and unbelievable surprise and this was proof that the Bosnian Pyramids and its underground system are not only the biggest, but also the oldest on the planet discovered until now. The Bosnian Pyramids are not the only case where the dates are surprising very old. Lately, in the center of Australia, in Flinders Ranges, has been found human presence and artifacts of a culture from 49,000 years ago. In Western Java, a big pyramid of 23.000 years old and also in China there are 250 pyramids, 20 are huge and older than 12,000 years, but impossible to visit. This is just a short list of some archeological sites, that reveal a revolutionary shift in the historical chronology of human civilization. The discovery of the Bosnian Pyramids should push back the timeline civilization for more than 20,000 years. This is also another reason why all these scientific discoveries, which would impress the scientific world, have been ignored by the orthodox academia and/or ridiculed by mainstream science and media until today. All these exciting discoveries made by Dr. Osmanagich and his international and independent teams, of course, lead to even more questions. A fundamental one, is to understand today, with modern technology, new disciplines of sciences and scientific verification of the energy phenomena, which is the real purpose of the pyramids. Maybe our modern science and experts in these kind of inter – disciplinary scientific methods, like scientists, physicists, electrical and sound engineers, anthropologists, geologists, archeologists and so on, will redefine, with all the logical opposition of the orthodox archeologists and historians, the true reason for these huge and complex geometrical structures, which always have been considered just mysterious tombs of important kings. Continuing their researches, four independent teams, in different years and during the four seasons, have all gotten the same results in their study of an energy beam at the top of the Bosnian Pyramid of the Sun. They discovered the presence of an electromagnetic beam of 28 kHz, with an approximately four-meter radius, a continuous and focused energy beam, coming out from, or going into, or both going out from and going into, the top of the Pyramid of the Sun. Fifty years ago, American researcher, Ralph Ring demonstrated, using ping pong balls, that 28 kHz is a frequency of levitation (anti-gravity). Because Mother Nature doesn’t create such energy beams, scientists know that it is artificial. Scientists were surprised that this energy beam was stronger the farther away it was from the top of the pyramid. This was a discovery of so-called “non-Hertzian” energy. Thus, it has been concluded that the Bosnian Pyramid of the Sun is a perpetual energy motion machine, that presumably has been working continuously for 34 thousand years. And the source of this strong electromagnetism is at 1.3 ml. ( 2,240 mt.) below the pyramid, produced by an iron or metal plate. With a scientific instrument, the biologist Harry Oldfield, built a PIP camera, (Polycontrast Interference Photography) that make it possible to photograph and see the ambient bio – energy fields, that are invisible to our eyes, like the human energy field, which are also studied. Photographing the different pyramids, in different season and years, they saw that these fields, just on the pyramids were vertical and not horizontal, like they are in any “normal” place. This was a clear demonstration that electromagnetic fields are very strong in all the pyramids. Showing that, obviously, a lot of energy is accumulated inside each pyramid and is released continuously in a strong flow. Also, mechanical energy studies, with sound and ultrasound, have been made. Sounds can be heard from 10 Hz to 20 kHz and the ultrasounds, which human can’t hear, are above the 20 kHz frequency, but today it is possible to measure them. The results of the ultrasounds made in different times, in different seasons on the top of the Pyramid of the Sun, had the same frequency of 28 kHz. To make it possible for us to hear, they have been recorded and then converted to 8 kHz, using the Compaunder, to have an idea which kind of sounds can be produced by ultrasounds. It was impressive to hear this kind of electronic sounds produced continually and with a fast speed. An electronic engineer from Serbia, measured more electromagnetic phenomena on the pyramids and in the Tunnel and he found extreme low frequency, called “Schumann Resonance” of 7.83 Hz. Everything resonates in nature, humans, animals, plants and this is considered, for many studies, the best energy field for our physical, intellectual, and spiritual abilities. Our Planet also, for the long time has been resonating at this frequency, before our modern electronic technology, which produces a lot of bad electromagnetism and effects its natural ionosphere frequency. In these last 20 years it has arrived at 16 Hz. Again, they recorded the electromagnetism of the Pyramid of the Moon and then converted it to sound. Also this result was impressive, more like music, always continuous, but different from the Pyramid of the Sun. All of these scientific discoveries have been ignored and/or ridiculed by mainstream science. But, even more interesting studies have been done on the Pyramids in these last 12 years. The Foundation has also created the beautiful “Park Ravne 2”, near the Tunnel’s entrance, with a lot of interesting sculptures and activities, as an extension of the site, open to all Visoko’s inhabitants and to all the tourists who come any time of the year. It is very important to understand the particularity of the Bosnian Pyramids project, that is the most open archeological project in the world. Any excavation and any independent, international, scientific verification of the energy phenomena are not a conventional, elitist, secret and mysterious discoveries. Everything is documented in the Museum at the site, Dr. Osmanagich’s books, internet website and different links and video about it. The future will be even more exciting and full of important and surprising discoveries. Especially with the excavation of the Tunnels which will provide access to the interior of the Bosnian Pyramid of the Sun. Only then we will have more information about the mystery of this very ancient, unknown, European civilization. And it will be not about finding Ancient “Bosnian” gold sculptures, artifacts and jewels….. and the mummy of a King!